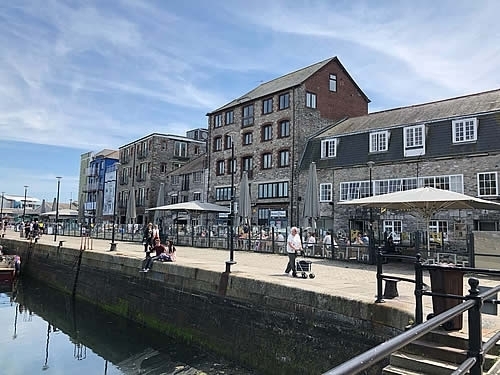 On Thursday we made the most of a routine trip to Plymouth with a visit to the historic Barbican and Hoe area. The sun was shining and there was a real holiday atmosphere, lots of people were sitting out enjoying the sun eating and drinking. We parked in the car park and strolled along the Barbican soaking up the atmosphere. 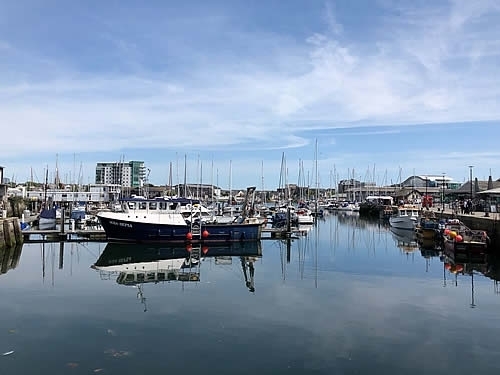 With cobbled streets, bars and cafes overlooking boats in the marina give it a real holiday feel. 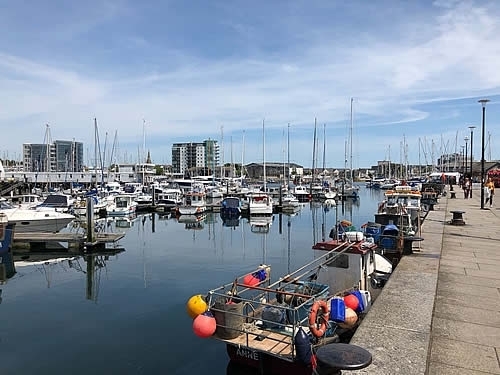 We considered fish and chips or a burger from the famous Captain Jaspers (a particular favourite for bikers) but it was full and so we decided to walk on and take in more of the views. There are now some lovely places to eat overlooking the Mayflower Steps that offer all kinds of coffee and very tasty looking light snacks. Walking on to work up an appetite we stopped in to look at the Mayflower Steps where the Pilgrim Fathers set sail to discover America. There are loads of tour boats that go from here and in the past we have enjoyed cruises up the River Tamar to Calstock, a lovely little village on the river about an hour away. 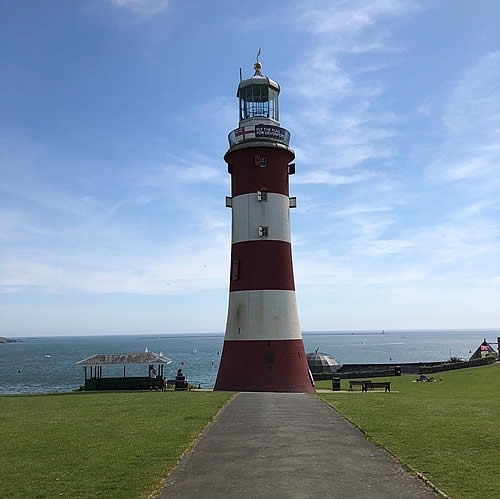 We carried on up the hill to the Hoe and it was now getting pretty hot, with people sunbathing on the grass beneath the fort. 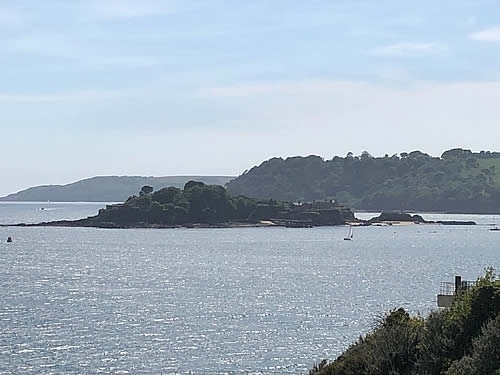 As we climbed the hill Plymouth Sound and Drakes Island came into view, it's a stunning panorama where you just want to stop a while and take in the views. With busy harbour there is always something of interest to take you eye. 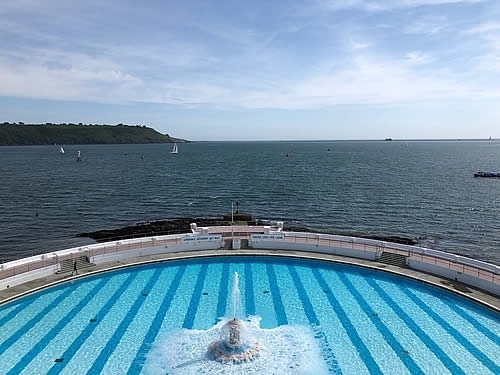 We decided to stop at The Terrace café on the cliff side overlooking the newly renovated Art Deco Tinside Lido Pool. It's a beautiful spot for lazing in the sun and we remonised on the days we use to go to the pool when the children were young. The Café offers a menu that is well priced (from £6 - £12) with lots of options from cooked breakfast to light lunches. We opted for the Panini's which were very tasty and accompanied by a small salad. The coffee was good and the service excellent and although it's not fine dining it's a great spot, good value for money and clearly popular with locals, which usually says a lot. We worked off our food with a walk up to the lighthouse admiring the views, we then wound our way back to the car again, considering an ice cream on route but managed to resist as we are attending a wedding tomorrow and have to worry about getting into our outfits!